George Graham Reviews Wes John Cichosz's "The Moon Threads a Needle"
As I have pointed out a number of times previously on series, the proliferation of singer-songwriters makes it hard for an emerging artist to stand out. There are literally thousands of folk-oriented guitar-wielding vocalists who write songs ranging from poetic to protest. Since there are a lot of literate lyricists among them, for me one of the best ways to stand out is musically, with compositions and arrangements that show creativity or musical sophistication in their arrangements or instrumentation. It also helps to have lyrically worthwhile material to begin with. This week we have a good example of a singer-songwriter, who though he is heard on acoustic guitar, is also a multi-instrumentalist on the album, and frequently works as a sax player supplementing other artists. 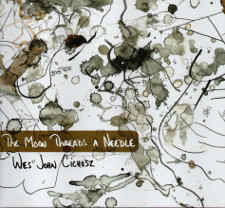 He is Wes John Cichosz, and his new release is called The Moon Threads a Needle. Wes John Cichoz is from Chicago and has had a lengthy career as a sideman. He began playing on the Chicago club scene at age 15. His musical abilities won him a full scholarship to the University of Illinois at Chicago. He played in jazz groups, including an ensemble performing Duke Ellington works. In the 1990s, he was performing regularly with members of the band Wilco and played a tenor sax solo on a Phil Collins record. He performs regularly in jazz, soul and blues bands, including one called ChiNola, a group that combines Chicago Blues with New Orleans funk. And he has worked as musical director and arranger for a 17-piece jazz big band called Evolution. As a singer-songwriter, he has performed with his own group called WJC, and previously released an EP under his own name. Now Cichosz is out with what is probably his first full album under his own name. Cichosz says that the album was inspired by some trying events in his life, such as divorce, financial frustration, as he describes it, death of a loved one and addiction. He said that the work he put into the album also helped his depression. He wanted this to be a personal record, so there is a lot of overdubbing with Cichosz playing most of the instruments. He said it started modestly with a used computer he got through Craig’s List, which he ended up using right up the mix, plus percussion instruments improvised from his kids’ toy box, a garage sale clarinet, and the like. But it ends up sounding thoroughly polished, given Cichosz’ long experience as a studio musician. He is joined by two of his frequent collaborators on the album, jazz keyboardist Jo Anne Daughterty and drummer Dan Leali, along with occasional contributions from guitarist Chris Siebold, whom we heard a while back on this review series with the band The Unknown New. The Moon Threads a Needle, the new recording by Wes John Cichosz, is a singer-songwriter project that stands out in the field because of Cichosz’ skills as an arranger and multi-instrumentalist. He draws on his extensive experience playing in groups ranging from straight jazz to blues to rock and funk. He brings those diverse elements into his music along with articulate lyric writing. The musicianship is tasteful and the arrangements avoid many cliches from both the commercial pop world and the singer-songwriter genre. Our grade for sound quality is an “A.” For an album recorded mainly on a second hand computer, it’s impressive with clean sound a mix that puts everything in the right place and where studio effects are used, they enhance, rather than distract. Although not perfect, the recording is also less compressed than most on the scene these days, so the dynamics, and ebb and flow of Cichosz’ arrangements are reasonably well -preserved. With a career mainly as a supporting musician on both guitars and sax, Wes John Cichosz’ premiere full-length album is an impressive project that brings a multi-layered approach to the singer-songwriter genre.